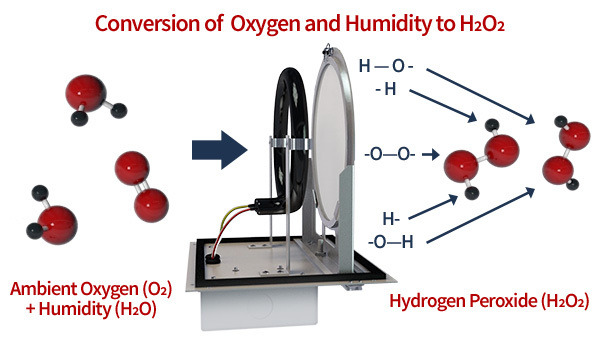 Synexis™ is the first company to design systems to produce hydrogen peroxide in the same physical state as the oxygen and nitrogen in the air. It is not mixed with water or with ozone. Dry Hydrogen Peroxide (DHP) offers a game changing capability for microbial reduction because it makes new strategies possible. With Synexis Systems, facility owners and managers have a new tool with a wide area of effect for the ongoing mitigation of microbial threats – even in occupied spaces and out-of-reach areas. Synexis Systems are the first devices to transform Hydrogen Peroxide, a molecule naturally present in your own body’s immune system, to exist in a gaseous state. Pioneering a revolutionary new, patented process to disrupt the cycle of a wide spectrum of unwanted microorganisms. By creating small amounts of hydrogen peroxide gas from natural air humidity, The Synexis System is a suitable, continuous solution with a wide area of effect – even in occupied areas. Under continuous use, the Synexis System achieves sustainable, wide-area reduction of common unwanted bacteria, viruses, fungi, and mold levels when first deployed. When continuously deployed it helps combat propagation of new microorganisms. Because Hydrogen Peroxide produced using the Synexis System is not mixed with water, the Synexis System can achieve efficacy at extremely dilute concentrations on dry surfaces, in the air, and in remote areas. Hydrogen Peroxide is a natural and essential part of human lung function and of our respiratory defense system. In our lungs, two enzymes continuously produce hydrogen peroxide, and a third enzyme, Lactoperoxidase, uses hydrogen peroxide to produce an antimicrobial compound that is crucial to respiratory defense. These enzymes maintain an equilibrium of up to 60,000 molecules of hydrogen peroxide per cubic micron of lung secretion. Air with DHP contains a maximum of just 25 molecules of hydrogen peroxide per cubic micron and does not overwhelm the enzymatic system which produces, consumes, and regulates the equilibrium of hydrogen peroxide in our lungs. The first US patent for the method of creation and use of DHP to remediate environmental microbial contamination was awarded to Lee Antimicrobial Solutions LLC (LAMS) in May, 2012. To date, six US patents and eleven international patents have now been awarded. 31 additional patents are pending.